You can easily manage your Sequel license codes with the BICODES utility included with your Sequel product (as of January 2013). Using the screen below, choose your product and press Enter. On the next screen, enter the license key and press Enter to apply. 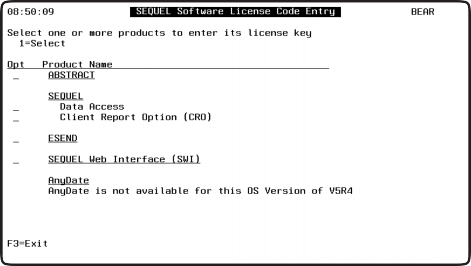 This section outlines the steps to apply a permanent license code for the following Sequel products: Abstract, Anydate, Esend, Sequel, and Sequel Web Interface. After you have been provided a code by HelpSystems, refer to one of the product sections below and follow the steps to apply the code. This command will present an entry display for your code. Enter the license code into the Authorization Code prompt. Issue the command: SWIPERM This command will present an entry display for your code.